Double-click the System Preferences icon in your Applications folder. Click the System Preferences icon in Launchpad. Click the System Preferences icon on your Dock. 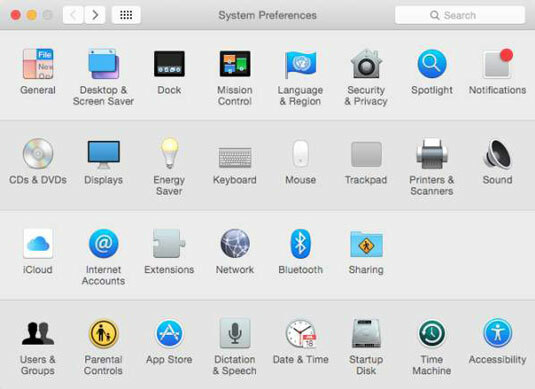 Click any of the icons in the System Preferences window. The contents of the window change to reflect the options for whichever icon you click. So, for example, when you click the General icon in the System Preferences window, the icons disappear and are replaced by the General preference pane. When you finish working with System Preferences panes, you should (of course) quit by choosing System Preferences→Quit System Preferences (shortcut: Command+Q). Click the Show All button in the toolbar to exit the pane and return to the icons in the System Preferences window. You can accomplish the same thing by choosing View→Show All Preferences, or by pressing Command+L; both return you to the window with icons for all of your System Preferences panes. Alternatively, you can choose a different preference pane right from the View menu or the Dock icon menu. If you press the System Preferences icon on the Dock (don’t click; just press and hold for a couple of seconds), a menu pops up listing all available preference panes. The cool part is that this works even if the System Preferences window isn’t open. When you know which pane you need, this shortcut is often the fastest way to get to it. Last but not least, notice that you can navigate to the next or previous pane you’ve viewed with the Back and Forward buttons below the red and yellow gumdrops (shortcuts Command+[ and Command+], respectively). Back and Forward commands also appear on the View menu. One last general tip before you work with an actual preference pane: You can get rid of the categories altogether and display the icons in alphabetical order. As a bonus, it makes the System Preferences window roughly 25 percent smaller onscreen. To switch to alphabetical view, choose View→Organize Alphabetically. The categories disappear, the window shrinks, and the icons are alphabetized. To switch from alphabetical view back to category view, choose View→Organize by Categories. 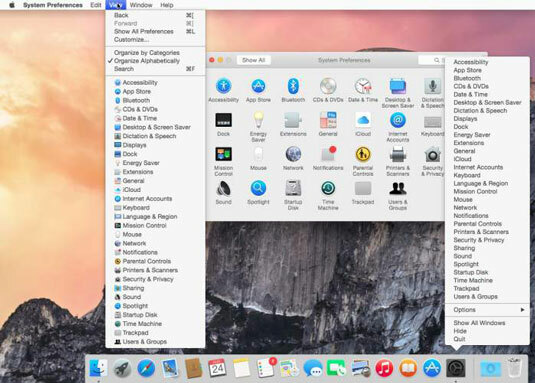 Yosemite lets you hide little-used System Preferences pane icons. To manage icons, choose View→Customize, and a little check box appears next to each icon. Uncheck the box if you want to hide the icon; recheck the box to make the icon reappear. Click Done when you’re finished checking and unchecking.